The Pembroke Hotel Kilkenny was so much more than we expected. 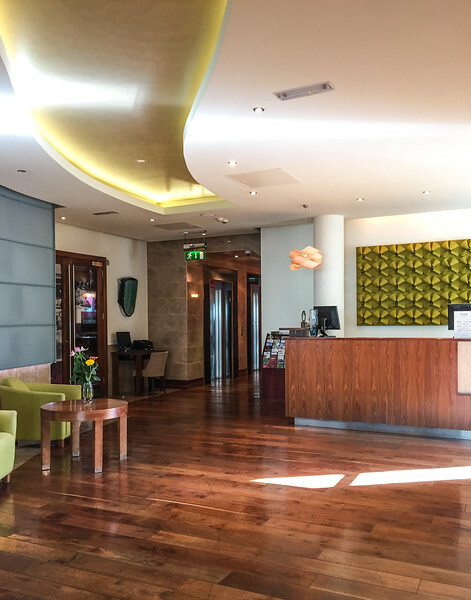 This stylish boutique hotel in the heart of medieval Kilkenny, Ireland, offers visitors a taste of modern elegance in the center of a medieval city, a perfect marriage if you ask me. I'm here to tell you why you should consider the Pembroke for your visit to Kilkenny and why I would stay again. Disclaimer: This is not a sponsored post. All costs were paid personally. My views are solely my own. Some of the links included in this post are affiliate links. By purchasing products using these links, you can support a Cajun in Cali at NO cost to you. Getting the goods you want while showing support is the best of both worlds! On a recent trip to Ireland, we decided to take a day trip from Dublin. After reviewing our Lonely Planet Ireland Guide for a few hours, we settled on Kilkenny, a small medieval city in the eastern part of the small island country. We chose Kilkenny after reading about the charm and culture of the historic town. And, since we didn't rent a car on our trip, we had to take advantage of the easy-to-use Irish public transportation and knew that the rail system would get us to and from Kilkenny in a jiff! After we had selected our city, we set about to find the best place to stay that offered the comfort and style we enjoy. 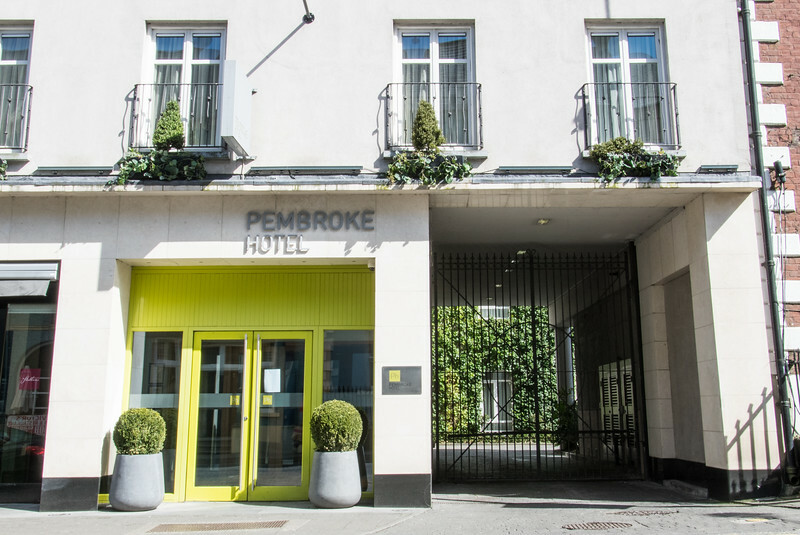 We picked the Pembroke Hotel Kilkenny based on the website, photos, and location. I was particularly enamored with the idea of a "castle view" room. SOLD! Upon arriving in Kilkenny, it became evident that the city is the living example of medieval Ireland that I'd conjured in my imagination. Colorful storefronts, perfect little pubs, and historic buildings line the streets of the lovely old town. I just love the city's motto "living history, loving culture." It sums up all the things I love most about travel. Some highlights from our trip to Kilkenny include visiting the Kilkenny Castle, the Round Tower at St Canice's Cathedral and Tynan's Bridge House Bar, the perfect pub. But more about that in a later post. Let's get back to the Pembroke! Although we knew we were going into the heart of medieval Ireland, we were looking for a more modern place to stay, something with a little more edge. We enjoy boutique hotels, finding them a cross between comfort, style, and quirk. Some of our best travel experiences have been in new, up-and-coming boutique hotels. I saw many great options for accommodations while searching for lodging in Kilkenny, but we wanted more modern lodgings than what we saw in other nearby hotels. 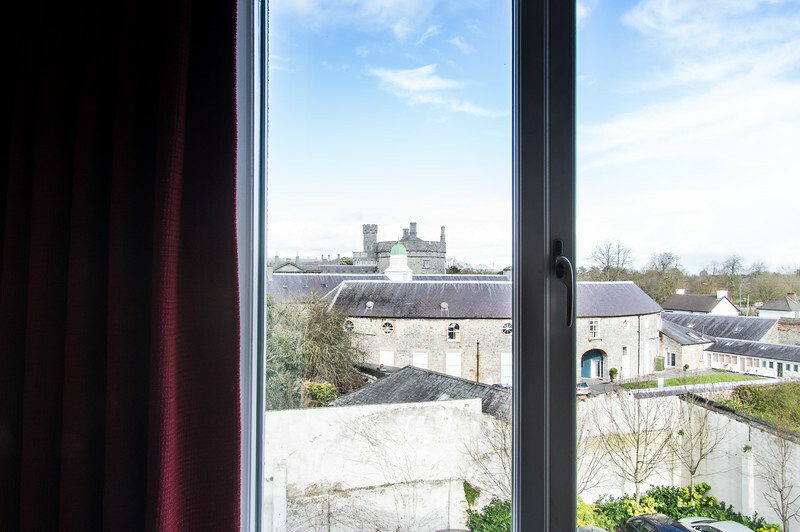 We chose the Pembroke Hotel Kilkenny because of the location, the modern amenities, and the castle view! 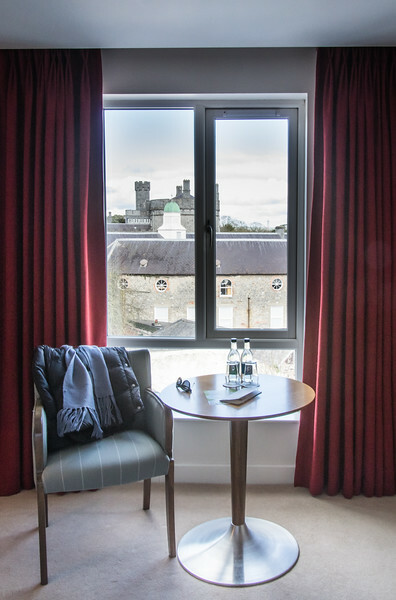 Located across from the Kilkenny Castle, the Pembroke Hotel offers castle view rooms at a fraction of the cost of other nearby hotels. We opted for a queen castle view room for €120 for the night. Now, I know this isn't budget travel prices, but we wanted to splurge a little and knew the upgrade was worth it. But, with over 70 rooms, Pembroke's many accommodation options are sure to fit any budget. Some of the other attractive amenities that caught my eye were the free Irish breakfast, free in-room Wi-Fi and on-site restaurant/bar, Statham's. Another bonus that I would take advantage of next time is the Mint Spa next door! When we first entered the Pembroke Hotel Kilkenny, I knew instantly that we'd made the right choice. From the super modern and sleek interior to the friendly greeting from the staff, we were instantly at ease. That feeling of comfort and carefree living didn't stop until we checked out the next day. We had just walked through the heart of medieval Kilkenny from the nearby train station, ambling through history on our way to our modern lodgings. So, the refreshments offered right inside the door were much needed after our train ride and walk. After some refreshing cucumber-mint water we were greeted by cheerful staff, eager to help us with check-in. We were provided with an orientation to the city, a helpful map and a few lunch recommendations before heading up to our room to deposit our bags. Immediately upon entering our room, I was left breathless by the gorgeous view. Although it wasn't unobstructed, it was still beautiful. It was the perfect place to have a cup of tea or morning coffee. I loved our welcome kit, which included two bottles of water and all the information we needed to make the most out of our trip. An initial tour of our room revealed an elegant bathroom, cozy robes and crisp, clean linens. After a brief rest, we set out on our way but not without stopping for a minute to ask for dinner recommendations. The friendly front desk staff was able to help us find the perfect fit based on our requests and our budget. They even rang the restaurant to make our reservations and seemed genuinely happy to do so. It sounded as though she was calling an old friend! I just loved that small-town feeling. It just so happens that the "old friend" is one of the best restaurants in the city located right across the street from the Pembroke Hotel. After a full day of sightseeing, we came back to the room for a little R&R before setting out for dinner. We napped with the window wide open, letting in the fresh air and the late afternoon sunlight. After watching the last of the light fade, we dressed for our night out on the town. We were so pleased with the recommendations for dinner and couldn't have asked for a better fit! Our experience at Zuni was exactly the type of elegant dining we enjoy. The locally sourced meats and vegetables paired perfectly with our wine in a cozy environment perfect for couples. Best of all, we could relax and enjoy our drinks knowing that we need only to stumble across the street to the Pembroke. We slept soundly under our warm duvet on the soft pillow-top mattress. And when we woke we enjoyed a spectacular morning view of Kilkenny Castle, which I savored along with my cup of artisan coffee, courtesy of Pembroke hotel. After a long hot shower in the super sleek walk-in shower, I felt ready to tackle anything. But first breakfast! Our last stop before hitting the streets again was the dining hall. We joined many another guests in the elegant dining hall, a welcome change from some of the other hotels we've stayed in the past. The breakfast buffet was fabulous, offering everything you expect from Ireland when it comes to breakfast. The Irish ham, sausages, and blood pudding were perfectly cooked. The eggs, sauteed mushrooms, and grilled tomatoes are perfectly seasoned. Fruit, yogurt, and pastries were on the menu, too! After filling our bellies to the brim with complimentary breakfast, we were ready to set off to explore the city. And we needed only to step out the door and walk a few blocks to get to the heart of it all, including the marvelous Kilkenny Castle and the neighboring Butler House Gardens. We were able to wander until our train arrived, knowing our baggage was secure at the Pembroke waiting for us to return. Although visiting Kilkenny wasn't on our original agenda, I'm so glad we did! When we decided to get out of Dublin for the night, we knew needed a sweet spot to stay. The Pembroke Hotel Kilkenny is a picture-perfect boutique hotel. Staying at the Pembroke Hotel Kilkenny was exactly what we hoped it would be: style, class, service and affordability. We typically opt for boutique hotels over large chains. And we prefer modern lodgings, particularly with an eye for design and attention to detail. The comfort and style we enjoyed are well-worth the money, not to mention the fantastic castle views! If ever I make it back to Kilkenny, rest assured I'd be back at the Pembroke in a heartbeat. I hope you enjoyed your virtual stay at the Pembroke Hotel Kilkenny! Consider staying if you ever make it to Kilkenny! Also, be sure to check out my complete itinerary for this quaint Irish city. I am in love with the Pembroke Hotel’s design! The reception area is just gorgeous. Great review. I know, right! It was so welcoming! I instantly fell in love. There are other Pembroke’s too, one for sure in Dublin. I’m hoping to check it out next time I visit Dublin. Great find. I was a little confused in the beginning because you said you wanted to see something medieval but all I saw was this beautiful modern hotel. Hehe. It is nice to be in luxury while in a heritage site indeed! That view was amazing! It looks nice to have the contrast between medieval and modern as I’m sure it made the medieval that much more special. The contrast was definitely what made it so special. I loved waking up in modernity and looking out at the castle. Spectacular way to start the day! You got me at medieval Ireland! The hotel looks super cute, but I’m up for visiting just about any medieval town! It was super cute and really comfortable. The convenient location is really what sealed the deal. And you can’t beat Kilkenny if you like medieval charm. The best I’ve seen in all my European travels.